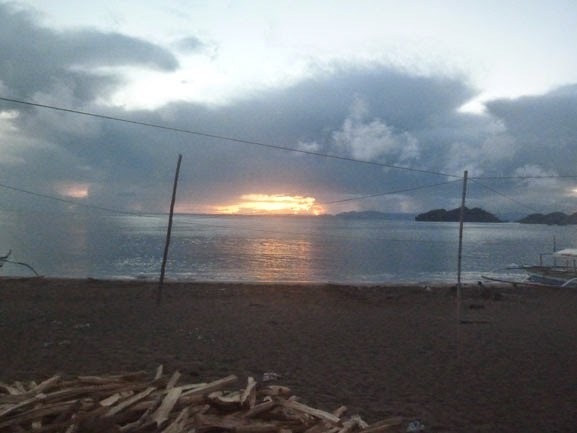 It was our 3rd and last day in Caramoan and I had wanted to walk along the beach and watch the sunset rise. Unfortunately, I woke up later than my companions so I was only able to take a quick snapshot before sunlight flooded everything brightly. Early morning by the beach. 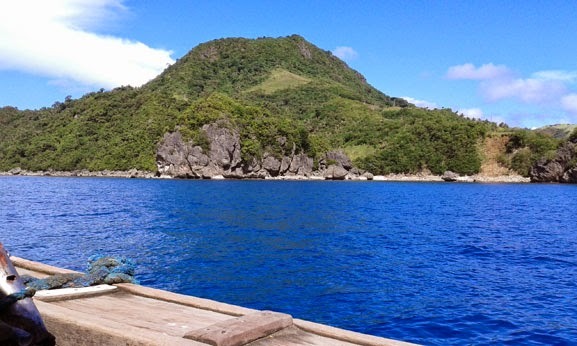 Our last stop before saying goodbye to Caramoan was an old church on the town of Tawog where we stayed. 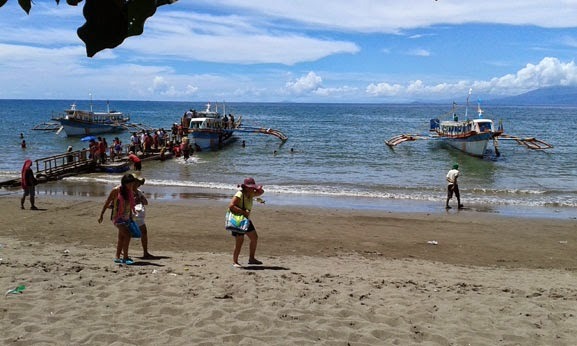 We got there via tricycle early in the morning before heading to the pier to board the motorboat to Sabang Port. 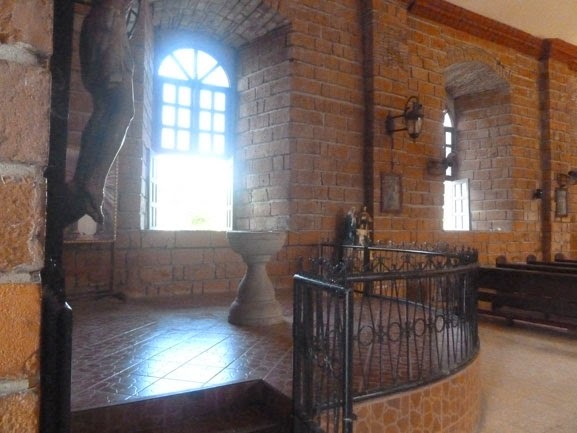 We had packed our bags the night before and after getting breakfast, we headed to the St. Michael Archangel Church, one of the oldest churches in Camarines Sur. I did not expect that there would be anything historic in this adventure but after 2 days of immersing myself in the wonders and beauty of nature, I was eager to see something different. 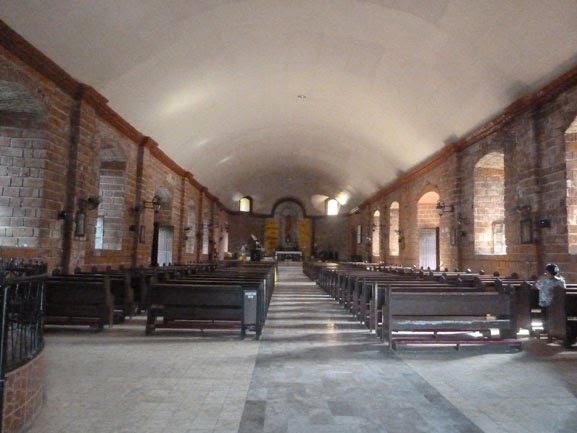 Interior of the church with only a few people early in the morning. Detail on the side adjacent to the altar. 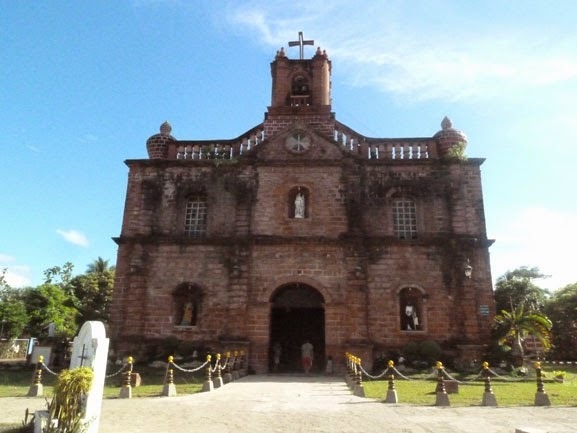 St. Michael Archangel Church is 300 years old and was founded in 1619 by Franciscan missionaries. The church is not very big and the church grounds not as grand as the churches I saw in Naga, for example, but it was well-kept. Although my poor photographic skills don't show it (also, my camera's lenses had gotten moist during the night because of the air-conditioning in our room, thus, the blurry pictures), the church looked charming with its red bricks against the background of green grass and clear, blue skies. After exploring inside the church and its grounds for a little while, we had to head back to the pier. But we did get a chance to buy some souvenirs at the market. 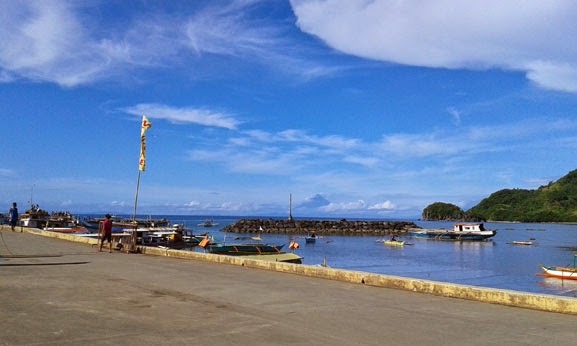 An hour's worth of motorcycle bumps and humps later, we arrived at the pier where we lined up for the 2-hour ride to Sabang Port. 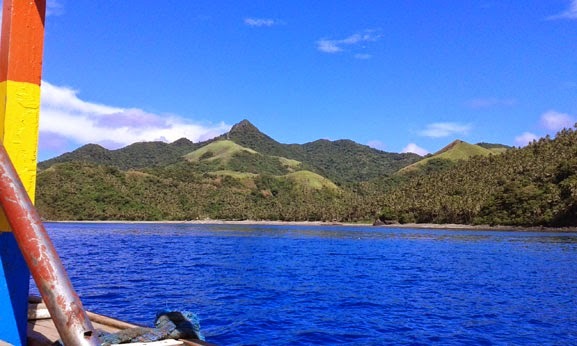 A closer look at one of the islands on our way to Sabang. These hills remind me of the ones in Bohol. The rest of the passengers unloading from the motorboat. 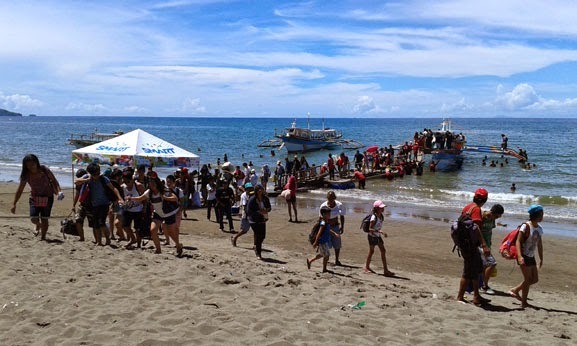 Another motorboat had unloaded its passengers, perhaps ready to go back to Caramoan. Again we we're shuttled off into our van and we began our journey to Naga where we we're to take a bus to Legazpi, Albay. 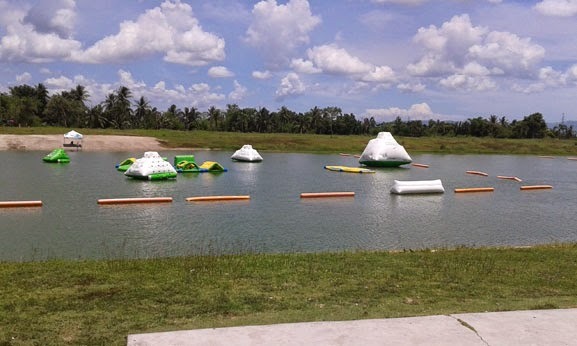 But first, we asked our van driver to let us stopover at CWC (Camsur Watersports Complex) where we checked out some of the wake boarding activities and took a breather from all the sitting we had been doing. Loving the view of fluffy clouds covering the mountain top. 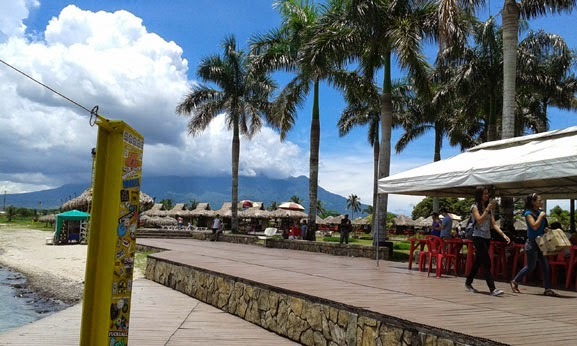 A water feature just outside the gate of the sports complex. Since this was not part of our itinerary, we did not actually get to do some wake boarding. It was also the middle of the day when we arrived so it was very hot and uncomfortable under the blazing sun. So after taking a quick look around, we headed back to our van. We were dropped off in Naga City where we had lunch at Grissini Ristorante along Magsaysay Avenue. It wasn't my first time in Naga and I had eaten along Magsaysay Avenue before but it was my first time to eat at this restaurant. We enjoyed a satisfying Italian lunch and even had the popular Sili Ice Cream (from another resto in the same complex as Grissini's).